Strength training is an essential component of an exercise program that complements cardio workouts and stretching exercises. Whether you lift weights or use resistance bands, strength training helps build muscle mass and strength. 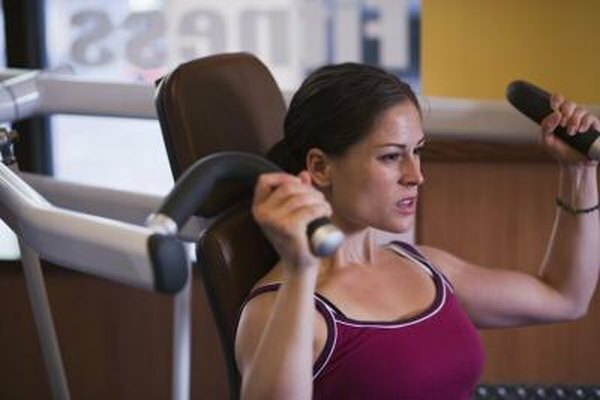 The American Council on Exercise says that contrary to popular belief, strength training will not cause women to bulk up. Rather, it will add definition to your body and improve your strength by up to 40 percent. Full-body workouts target all major muscle groups in a single exercise session, which is popular among those who have limited time for exercise. The USDA Center for Nutrition Policy and Promotion and the Department of Health recommend that adults do total body workouts that target all the major muscle groups twice each week in addition to aerobic exercise. Rest briefly after each exercise, or work out without breaks to increase the aerobic element of your strength training session. Allow at least two days between workouts so your muscles can recover. Once a particular exercise has become easy, add additional weight so that you continue to benefit from total body workouts. By building strength and muscle mass, you can improve your performance in other activities. Building leg muscles will improve your running or cycling speed. You can use your added strength to increase your exercise intensity for greater calorie burn and better weight control. Full-body workouts approach strength training in a structured fashion so that you do not overwork your smaller muscles before the larger muscle groups in your body. Factors affecting how often you can do full-body workouts involve the effects on the muscular system. The act of building muscles requires that muscle fibers become damaged so that the body can then repair them. The muscles adapt by becoming larger and stronger. The recovery process, however, requires time to repair the damaged muscle fibers. Doing total body workouts on consecutive days will increase your risk of injury. You should plan two rest days after an exercise session. Begin your full-body workouts with the larger muscle groups of your upper and lower body. Smaller muscles such as your biceps and triceps will support the larger muscles when doing exercises targeting the upper body. Avoid fatiguing smaller muscles early to complete exercises targeting larger muscles first. Your exercises should work your muscles to the point of fatigue. This is an indication that you have worked out hard enough. You can do this with just one set of exercises, as long as you challenge your muscles sufficiently.